This story starts last year with my son Rhino befriending the director of Camp Cherokee. Rhino told him about his Youtube Channel MTG_YoungMage, Magic the Gathering and what the game has done for him. The Camp Director was intrigued and asked Rhino how he could make Magic available to the scouts as an evening activity each of the six weeks of camp this year. The goal of Young Mage is “Reaching and Teaching Young Mages of all ages.” This was a perfect opportunity to see what we could do to reach and teach more players. So the work began on how to make, advertise and run a tournament six weeks in a row at a camp in the woods. We had a lot of grand ideas, but decided to start out small and see how things went. We didn’t know how to advertise a Magic tournament to each scout and we didn’t want to exclude scouts that didn’t have any cards, so Rhino talked to Wizards of the Coast who were kind enough to supply Welcome Decks. This way everyone would have the same level deck and it wouldn’t be too complex for anyone that was new to Magic. The tournaments would be simple single or double elimination. Basically like a Game Day casual tournament. Rhino met with the Camp director early this year and taught him how to play. He laid out the plan to run each event and that Wizards of the Coast would supply the Welcome Decks for the events. We would supply a video to help teach the basics of the game and see how it went. The Camp Director assigned the task of running the events to the STEM (Science, Technology, Engineering and Math) team since he saw that it required lots of problem solving and quick decisions. We had never thought of Magic as a STEM activity, but now see that it truly is. With decks ready, camp staff prepared and the first week of camp starting, the experiment began. On the first day of camp all of the evening activities were announced. Basketball, frisbee golf, gaga ball, soccer, archery, swimming, astronomy, chess, and Magic. Excited murmurs were heard from all of the scouts and signups began. The first to fill up was Magic. It turns out that each week, the first activity to fill up was Magic. The Nature Lodge, where they held both chess and Magic was standing room only. Extra picnic tables were brought out for the overflow. The games were all over the place. People who didn’t signup were standing around trying to figure out what this Magic game was all about. The cards were unsleeved and being played on dirty wooden picnic tables. But the scouts were having a great time and learning. For five nights, the scouts would bring back their cards and continue playing. They would hand off decks to their friends so they could learn and play. Scouts from different troops and crews sat across from one another and talked. 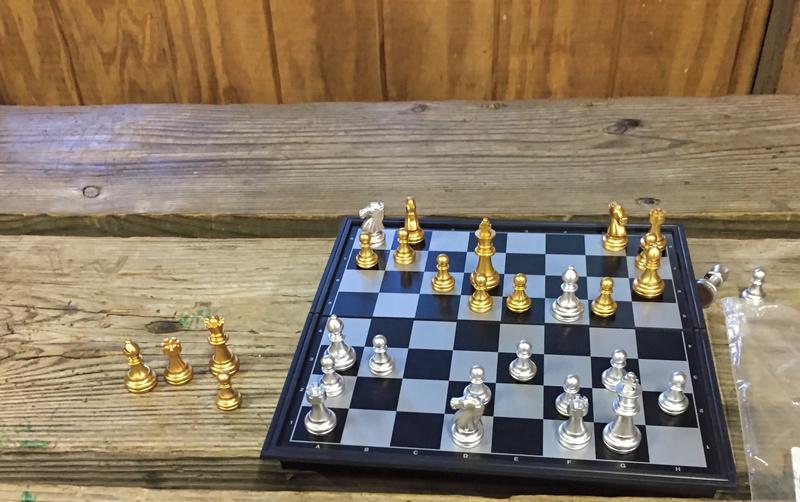 They learned more about each other and had a friendly game. Even though it was a competition, it wasn’t super competitive. The comments we heard throughout ranged but were all very positive. “Magic is the best game ever” and “Magic is growing a lot right now” was very common. 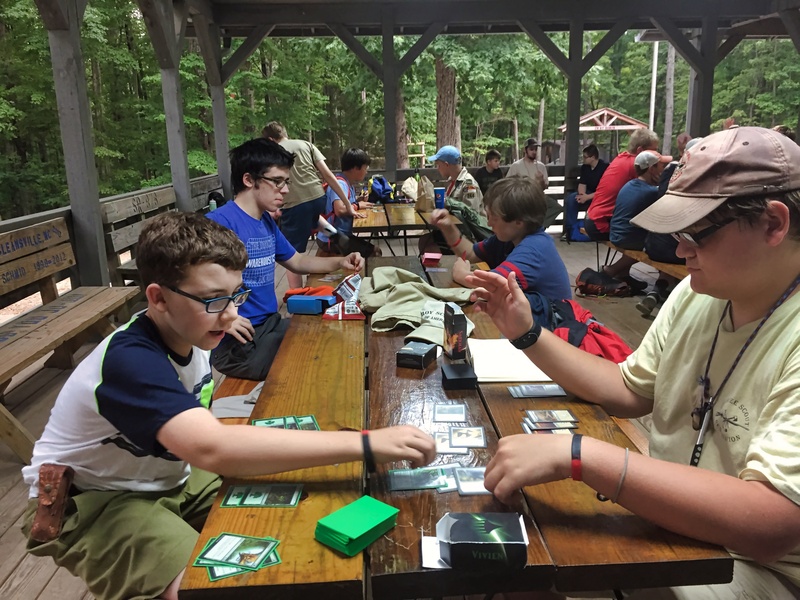 The impression of the scouts was that Magic: the Gathering was not only the best of the card games, but the one that’s growing more than all the others. We heard comparisons with other popular card games and Magic was always the most favored. There were even some rather humorous comments heard through out like, “Unsummon is a really over powered card”, “Nightmare is the best creature ever” and “I’m going to throw my chess tournament so I can play Magic.” But some of the most amazing things we saw was scouts trading cards from the Welcome Decks. The cards they received for free became prized items with intrinsic value and every scout wanted to continue playing after they got back from camp. Magic's community is large. I don’t think anyone can know the exact number of players, if it’s one million or thirty million. It’s a lot more players than we see on the competitive circuit or social media. For the most part the scouts had heard of Magic but had not known that there was a community, content creators or even a Pro Tour. They were just excited for the game. There was one troop that had driven over 10 hours to Camp Cherokee just to try something different. Some of the scouts at the tournament said that they wanted to come back next year because they do things like this. 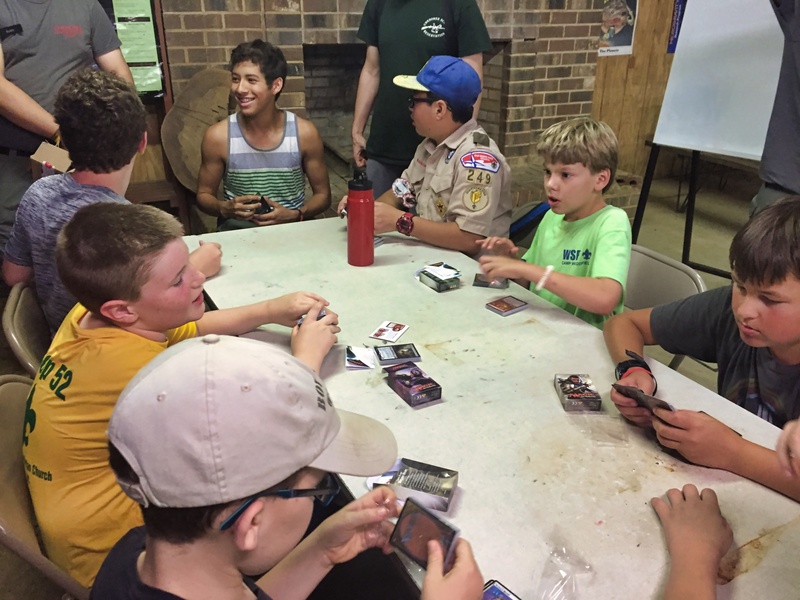 The average number of scouts each week is around 275 with around 30 of them actively playing Magic either with the Welcome Decks, a borrowed deck or one they had brought from home. Most of them were new to Magic. Over the 6 week period we would guess that this facilitated about 200 new players. When we started the Young Mage channel, we knew that the new players we were trying to reach were going to be one of the hardest, if not the hardest niche of Magic players, with whom to connect. However, it is becoming easier. We were amazed at the positive feedback we received. The excitement of the Scouts to play and learn was amazing. All-in-all it was time and effort well spent. We were asked if we could do the same thing for next year, but we think we’ll need to go back to some of those grand ideas we had in the beginning. The Welcome decks are a great start and equalizer, but if we could add a bit more that will help keep it fresh and challenging. For the most part, keeping it casual is very positive. Not every rule is being followed 100% exact, but it doesn’t need to be. We think adding in a pack or two from the current set would enhance the experience. Even making booster packs available for sale at the trading post would be amazing. We’ll have to talk to Wizards of the Coast about the viability of doing some of this.